If I ate what I wanted with no regard to proper nutrition this pregnancy, my diet would look something like..
Alas, I try to mimic a more socially and medically acceptable diet for, you know, my health and the health of the little person swimming around inside my abdominal region, and I skip the dessert-for-every-meal approach that I yearn for. 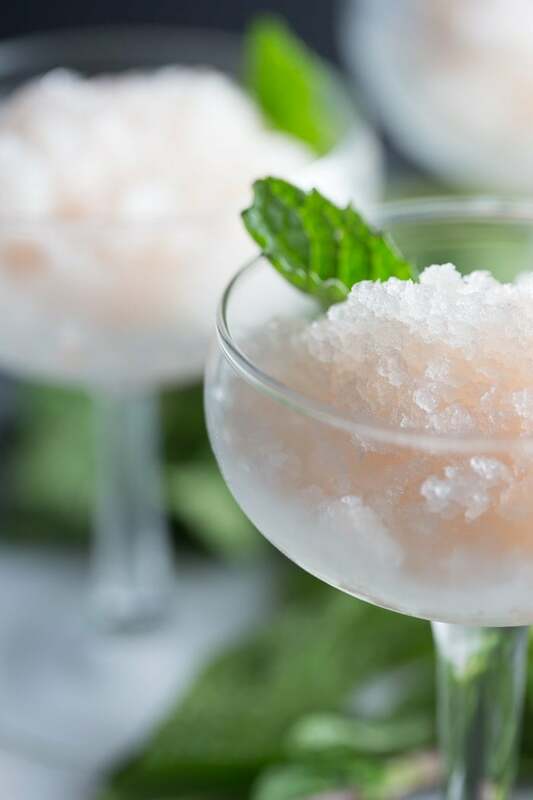 That being said, I never feel bad about a little snacky snack of this granita, because it’s loaded with grapefruit juice and is so cold and refreshing and perfectly sweet and just a little bit tart, and it’s so light that I don’t bloat up like Violet Beauregarde post-indulgence. I of course bought a grapefruit this week because–ah!–baby is the length (hopefully not girth) of a freaking GRAPEFRUIT, you guys, and I needed something to do with it besides wrestle the segments out of their straightjacket-like piths and membranes. 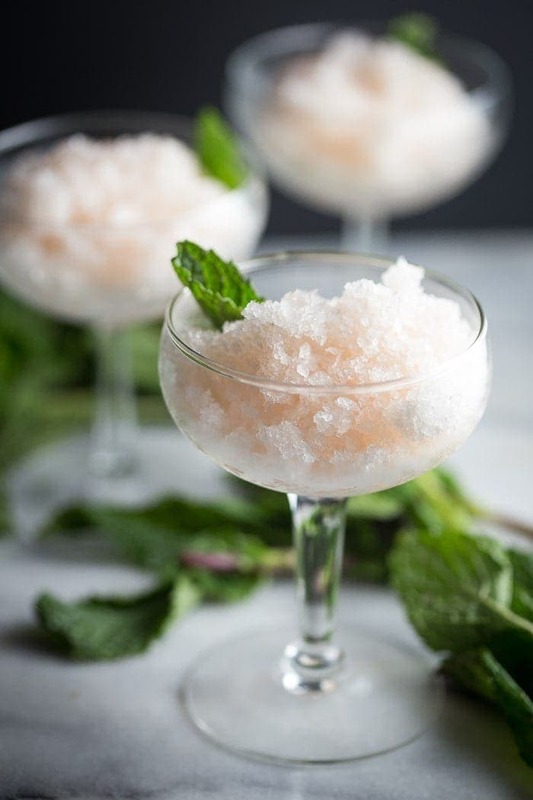 I’ve been craving light and refreshing foods lately–just ask O about my attempts to serve cold somen as dinner every night, but I’m also incredibly lazy/easily tired, so granita seemed like the perfect solution. 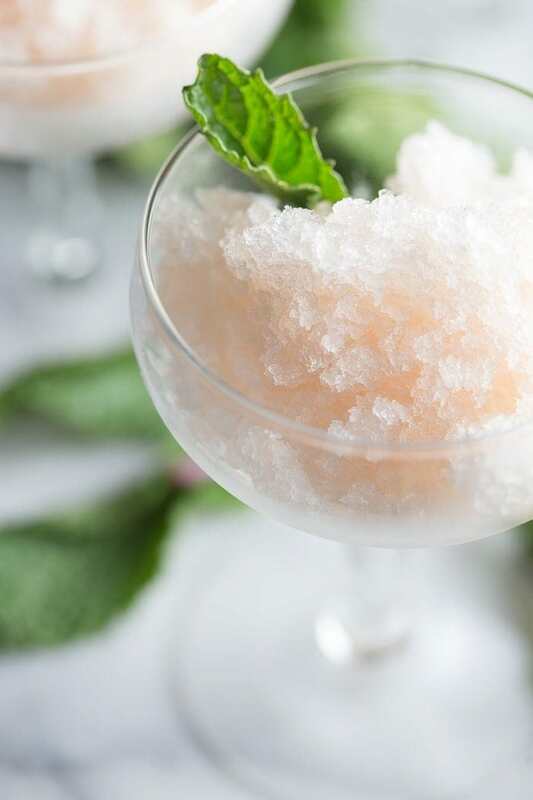 I recently developed a grapefruit-mint bourbon cocktail recipe for a company (will share soon… ish… as said recipe is aimed at holiday festivities rather than summery backyard day-drinking) and was inspired by the perfection of that flavor combo to bring it over to a summer- and preggers-friendly treat. I was actually surprised by how good it was. I even texted my mom, and we have a conversation that went a little something like this.. Her: Yum! Did you tell O about that secret surprise? Me: No, whatever. Back to my granita!!!!!! And then she came over a couple days ago to help paint the master bedroom (because delicate pregnant ladies shall not inhale paint fumes lest the baby come out with an extra arm) and I basically forced a bowl on her after I’d finished shooting. 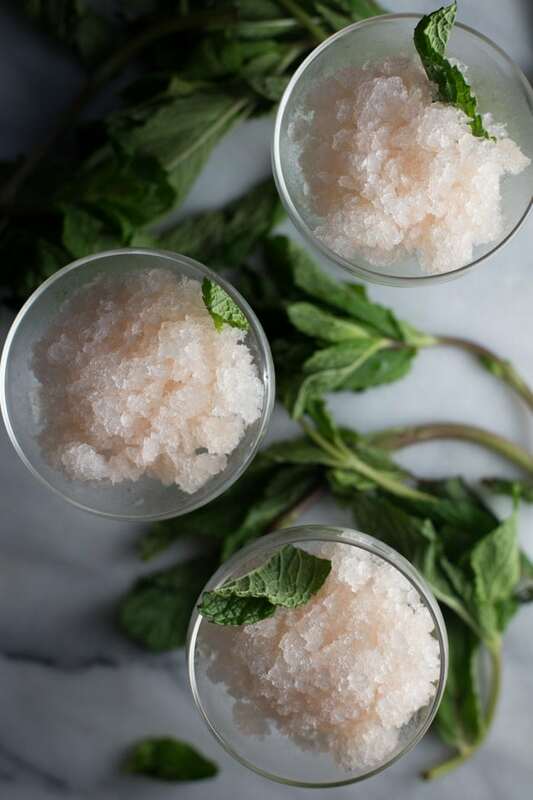 It’s the perfect palate cleanser, an elegant option for a dinner party dessert, or a super simple refresher to keep in the freezer for funsies. You’ll love how the bitter grapefruit is tamed by just the right amount of sugar and lifted by the cool mint, how it melts in your mouth so delicately but has enough flavor to deserve a comic book-style “kerpow!” speech bubble dangled overhead. You’ll freak out at how easy it is to make and keep on hand, always just a few scrapes of the fork away. I highly recommend making this, like… immediately. Tart grapefruit bridled by the perfect amount of sugar, balanced with cool, fresh mint. Perfectly refreshing, simple, and elegant. Vegan. Bring water, mint, and sugar to a boil in a saucepan, stirring until sugar is dissolved, then reduce heat and simmer, uncovered, 3 minutes. Add grapefruit juice and pour through a fine-mesh sieve, pressing hard on solids and discarding them. Cool completely. Freeze mixture in a 1 1/2- to 2-quart shallow nonreactive metal container, stirring and crushing lumps with a fork every 30 minutes until evenly frozen, 2 to 3 hours. Scrape with a fork to lighten texture, crushing any lumps. Spoon into glasses or bowls. 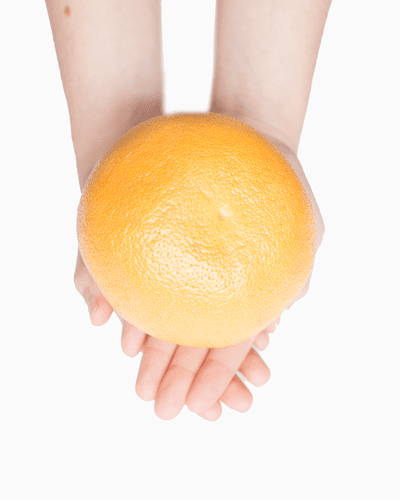 I’m 17 weeks pregnant and baby is the length of a grapefruit! If you hadn’t gleaned.. This looks awesome!! I almost got this for our wedding as a pallet cleanse. So refreshing! Uhhh, this site redesign? LOVING IT! Those social icons are adoooorable. 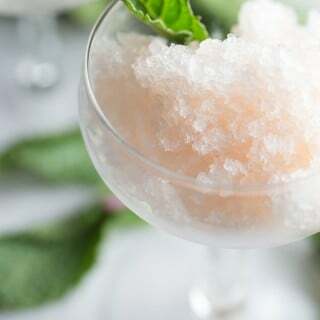 And this granita is calling my name. Pinned! This looks so refreshing! We’ve been getting some warm days and I think this sounds wonderful to cool off with! I’m attempting a blueberry basil granita on Tuesday! Also.. keep those adorable baby bump photos coming! Love the sound of these granitas and the beautiful colors in the photos. Also LOVE the new rose design of the site, it looks gorgeous!